Chris Wright did himself and Nene Valley Harriers proud with a 75th place finish in the Vitality London 10,000m on Monday. It was the 25 year-old first race since April’s London Marathon, and he returned to the capital full of confidence after a pleasing marathon debut. Wright clocked a time of 32:40 on a circuit which took in many of the capital’s most famous sights as it wound it’s way from The Mall to the Bank of England and back. Wright was the only Harrier to finish ahead of ladies race winner Joe Pavey. Michael Channing was the next Harrier home finishing 160th in 34:19, just 10 seconds ahead of Bretton chip shop owner Rob Brownlee. Lee Harthill and veteran Sean Beard squeezed into the top 500 with times of 38:02 and 38:42 respectively with Jay Belham 566th in 39:02. 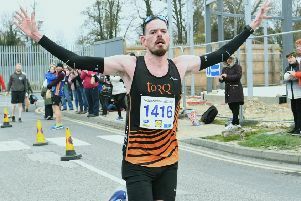 Timothy Hunt completed the Nene Valley male contingent coming home in 48:05. Ruth Jones led the Nene Valley ladies challenge, crossing the line as 108th lady in 41:55. Louise Blake finished 262nd in 45:43 and Sophie Wilkinson-Hargate was the 292nd lady home in 46:22. A handful of athletes from other local clubs were also in action and perhaps the best performance came from Rosslyn Loutit of Yaxley Runners who ran a time of 44:35, finishing as 16th Over 50 lady. Stamford Strider Simon Fell placed 254th in 35:45, 30 seconds and 33 places ahead of Peterborough AC’s James Sadlier. Eye veteran Roy Young ran well finishing as 45th Over 55 with a new best time of 45:50. Nene Valley youngster Josie Fortune had a fine run finishing ninth in the curtain-raising Westminster Mile Under 17 race in a speedy 5:36.9. Philippa Taylor had the honour of lining up alongside long distance running legend Tirunesh Dibaba on the elite start at the Great Manchester Run on Sunday. The 49 year-old Nene Valley Harrier finished several minutes and 15 places behind the five-times world champion and three-times Olympic gold medallist with a 38:33 clocking. Despite being slightly disappointed with her finishing time Taylor was thrilled that she’d had the opportunity to run in a quality field in front of TV cameras. The annual Peterborough 5k Grand Prix series kicks off next Wednesday (June 7) at Ferry Meadows. The event has been running for over 25 years now, and the format will be unchanged with all the races starting at 7:30pm with a Junior 3k race preceeding the main event at 7:00pm. The annual Cambridgeshire Schools Track & Field Championships took place in Cambridge on Saturday. Cambridge won all age groups but there were a number of fine performances by athletes in the Peterborough Schools team with Ellie Forrest claiming two titles. Highjump - Tomi Oginyoye 1.75. Discus - Kai Harrison 44.40. Sprint hurdles - Elizabeth Taylor 12.5. High Jump - Ellie Forrest 1.45. HighJump - Megan Porter 1.65.